According to the National Institute of Mental Health, 40 million people in the U.S. are living with anxiety disorders. There are many ways to manage these conditions, but as a sufferer myself, I’ve discovered that a thoughtfully planned home environment is critical to my well-being. Much as our food selections affect our physical bodies, I believe that design choices impact our state of mind. Thankfully, the growing field of neuro-architecture has confirmed my intuition. By researching how the brain and the body respond to different features like layout, furnishings, lighting, and color, science has proven that our overall health is directly affected by the styling of our personal spaces. The most important place to begin is in the room where you sleep. This should be a sacred space that allows your brain to rest from our overstimulated world. Like all living creatures that burrow into holes or build nests, our basic human instinct craves intimate places to feel safe and protected. A room with a lofty ceiling, where your body subconsciously feels vulnerable, is not ideal for sleeping. Finding smaller quarters that feature a comfortable bed without televisions or computers will train your mind to shut off its alert system so you can completely relax every time you hit the pillow. Ambient lighting and textured surfaces also play an important role in creating a nurturing environment for our psyche. If everything is smooth to the touch or features bright overhead fixtures, we stunt our ability to experience the sensory world around us. By integrating woven textiles and dim lamps in our bedrooms, we activate our ability to feel. Often, it’s through the physical body that we trigger the emotional heart, so these kinds of tactile elements can help awaken us to the important relationships of our lives. If you want to feel strong and alive at home, you owe it to yourself to create zones that are enriched with positive energy. That’s why it’s critical to embellish with objects that inspire you deeply or hold a fulfilling memory. Too many collectibles can create visual noise, so it’s better to surround yourself with a few select items that carry special meaning. When it comes to your walls, choose colors that support the soul. Think about your personality in its most comfortable state and what happens when you’re enveloped by certain hues. What colors feel empty? What colors feel overwhelming? What colors feel empowering? If you want to figure this out, look at the shades and tones of your favorite clothes, and then seek out some matching paint chips. 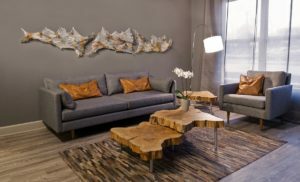 You may be surprised to find that rich, deep earth tones are what elicit a visceral response, making them a better fit for fostering your personal well-being than the sterile, white-on-white design trends so popular today. Knowing that our brains have an innate urge to seek order out of chaos, it’s also good to integrate earth-based patterns in your common areas wherever possible. Even though most of nature’s motifs are asymmetrical, it’s the repeating aspect of the imperfect elements that add serenity to a space. Whether it’s wavy surface contours or flowing artwork with organic forms, the latest research indicates that references to nature in the home, not just nature itself, reduces anxiety in humans, becoming a built-in healing tool anyone can access.